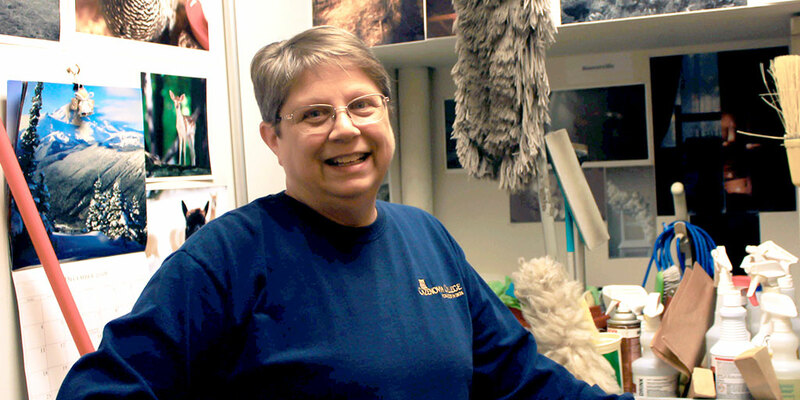 Diane Boswell is a Campus Service cleaner at Cazenovia College. She works with the Maintenance Department Monday through Friday to clean Reisman Hall and other classrooms around campus. Boswell also helps in the mailroom when needed and during the summer she also cleans residence halls. The difference between being a housekeeper or a cleaner is simple. While both positions interact with students, housekeepers work inside residence halls, while cleaners work around campus in classrooms and office buildings. Before she started working at Cazenovia College, Boswell was a stay-at-home mom for ten years. She returned to work in the cafeteria at her children's school. She started at the elementary school and moved schools when her kids moved schools. Boswell began working at Cazenovia College in 2007. She was a temporary employee in the dining hall, and then moved to maintenance where she has been ever since. When Boswell is not working, she enjoys reading, making quilts, and is an occasional golfer. Boswell explains, "It is not my favorite thing. I mostly like to ride with my husband in the golf cart." Boswell and her husband have two dogs, including a 13-year-old pug. Boswell shares, "That one is my favorite." She also cares for her daughter's dog. Boswell is proud of the work she does at Cazenovia College. She says, "It has been enjoyable to work here."